The Wyanoke Plateau is one of the more rugged parts of the NJ Highlands, located in the northern reaches of Passaic County. It rises to the west of the Wanaque River valley (I believe "Wyanoke" and "Wanaque" are different Anglicizations of the same Lenape word relating to sassafras). The steep slopes up from the river valley, now mostly submerged under the Wanaque Reservoir, at ~282 feet, to the hills and mountains of the Wyanokes at 900 - 1200 feet, form some of New Jersey's most mountainous scenery, and best hiking country. 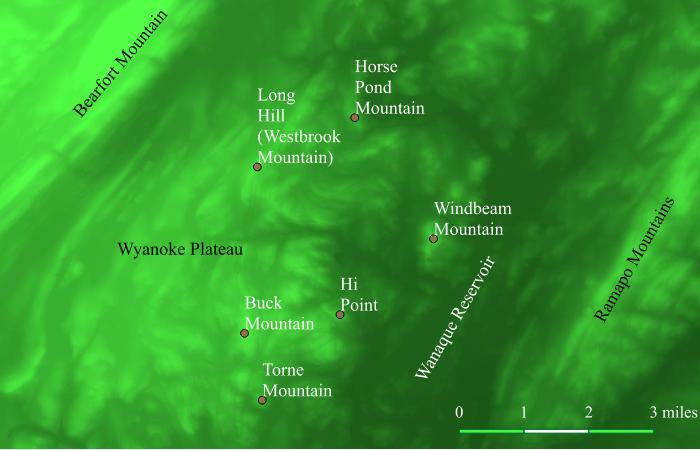 The highest point on the plateau is Buck Mountain in the southwestern corner of Norvin Green State Forest. The top of the plateau is not that flat. It's a jumble of exposed ledges, glacially-scoured hilltops, and narrow rocky valleys with steep mountain streams. An intricate mixture of Precambrian gneiss, granite, and various mineral-rich metamorphic rocks underlies the area. It's not as much of a mountain range as the Ramapos to its east, but a very rugged area, crossed by only a few roads. Much of the plateau is state land, in Norvin Green State Forest. There is a lot of good hiking.